Her name is Itsy Bitsy and she is the worst nightmare of Spider-Man and Deadpool by killing in their names! A group of small-time villains with issues calling themselves Hateful Hexad consists of Bearboarguy, Gibbon, Ox, Squid, Swarm and White Rabbit were planning to rise above their situation of constantly getting beaten down by heroes only for Deadpool and Spider-Man to come at them all of a sudden, out of nowhere. The duo makes a quick work of these lowlife criminals with a great team-up effort but Wade got stabbed through his chest by White Rabbit when he was feeling a bit jumpy when talking about how things are with his wife, Queen Shiklah. His face is not disfigured anymore and he became a good guy, which is not working well for his married life. They wrap things up with Spidey webbing up Squid but then noticed that the baddie is choking on it and try to tear it up a little to give him room for breathing. DP points out that he don’t remember stabbing Gibbon and then a sword hits Squid on the head. Bearboarguy goes down too and Ox is stabbed with three swords on his back. Deadpool was successful in saving White Rabbit when she was being pulled upward by the neck. A blue-skinned new villainess with six arms, resembling to an awfully weird amalgamation of the two then reveals herself to them as Itsy Bitsy, after offing most of the Hateful Hexad members and left quickly when the heroes started charging at her. Back in their hideout Dead-Cave, Wade urges Spider-Man to stop playing Overwatch and asks him to find the punk-rock chick they met earlier. He called Patient Zero over to their clubhouse after figuring out he has a vendetta on Dee Pee. The villain accepts that he created her to destroy them but she wanted to team-up with the heroes. Seeing his creating having an opposing view, Patient Zero came seeking protection but got sliced into pieces before he could reveal much about her or his own identity. Itsy Bitsy wants to fight crime together with her "Daddies" and came to convince them that she is on their side but got rejected nonetheless for her violent methods. Since she posses both of their powers, Deadpool and Spidey was having a tough time dealing with her even after pushing to their limits. Sick of getting punched, stabbed and his clubhouse being ruined, Wade blew up his vehicle Dead-Buggy full of hundred pounds of C4 explosives to unsuccessfully get rid of her and ended up in Weirdworld. There they came across a Dragon, Glarkomen Ogres, Moloids, Witch Queen Morgan le Fay herself and Sl'Ur'Boroth, The Forgotten during their short stay. Dee Pee and Webs even fought for the freedom of Ogres before returning back to Earth. Away for a few hours, the duo returns to find out more than a dozen criminal corpses webbed up by Itsy Bitsy. Ever since Peter Parker returned from afterlife, Webhead has been feeling a bit empty inside and no matter whatever he does, there will always be something missing. Tangling down with this psychotic killer chick that kills in their names, they have been failing each time they tried to stop her when she goes on a killing spree of "Bad Guys". Wade believes they need to level up and calls in Nightcrawler for some sword fighting lessons. Arguing about whether to kill her led to a point where Wallcrawler decapitated and sends him to Hell. Shiklah arranged a meeting for him with Patient Zero while Demon Bamfs were sewing his head back to his body and Spidey goes to take down Itsy Bitsy. 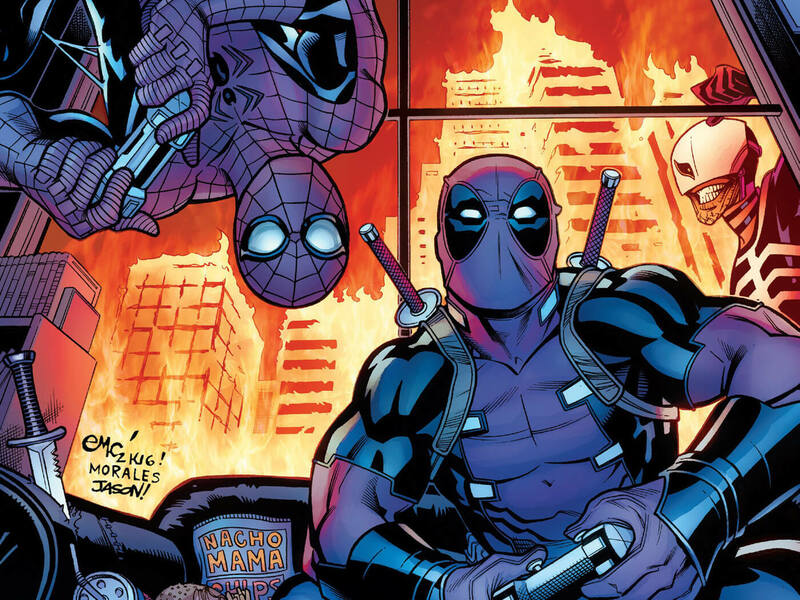 Here is your links to buy "Spider-Man/Deadpool – Itsy Bitsy" from Marvel Comics in issues on Amazon. Here is your link to buy "Spider-Man/Deadpool – Itsy Bitsy" from Marvel Comics on Amazon. Teaming up for the second time after working on "Isn't it Bromantic" storyline, writer Joe Kelly (Emperor Joker, Justice League Elite) and artist Ed McGuinness (Amazing X-Men – The Quest For Nightcrawler, Avengers – X-Sanction) returns to deliver another action-packed adventure of Spider-Man and Deadpool for Marvel Comics in 2017. 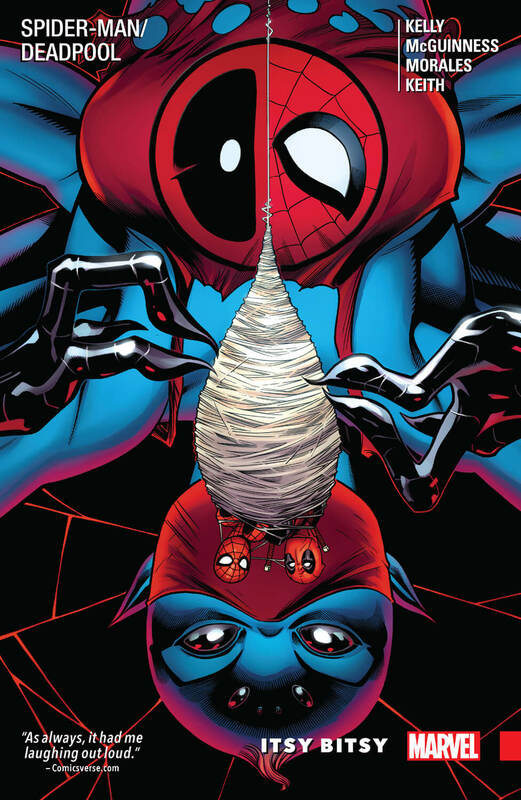 Collecting issues #9-10, 13-14 and 17-18 from Spider-Man/Deadpool monthly ongoing comic-book series, "Itsy Bitsy" is a six-part story that introduces a new villainess who is faster and stronger than both of these heroes. Singing the nursery rhyme akin to her namesake, she does everything they despise but cannot be stopped anyhow. On surface, it all looks like a vendetta of a madman gone wrong that has given birth to a genetic freak that is tormenting those costumed crime-fighters but someone with a twisted motive is actually pulling all the strings in order to break one of them. Situation went so dire that the friendship among the heroes even started to nearly crumble. Aside from Anna Maria Marconi, Queen Shiklah and Mephisto, X-Men member Nightcrawler showed up for a surprise cameo. Reference of "The Death of Gwen Stacy" arc was unknowingly made by the Merc with a Mouth. Up next, they are about to chase tails of villainous Arcade and walking cartoon Slapstick for some "Serious Business".